Willie Bouyer played along such notables as Andre Rison, Bobby McAllister and Lorenzo White, while being a part of the last great Michigan State Spartan football teams. Originally a free agent signee by the Seattle Seahawks after going undrafted in 1989, Bouyer played in one game, making one reception for 9 yards that season, and then spent the whole 1990 season on the practice squad. In 1991, Head Coach Chan Gailey and the Birmingham Fire made him their first round choice of the positional draft and he’d become established as the team’s #1 receiver and speedster, making 28 receptions for 456 yards and a strong 16.3 yard average. Willie scored 2 touchdowns that season, both against Orlando where he caught an 87 yard bomb and a 21 yarder to key the team’s 31-6 victory. Against the Dragons in the playoffs Bouyer made 9 catches for 115 yards in a losing effort. 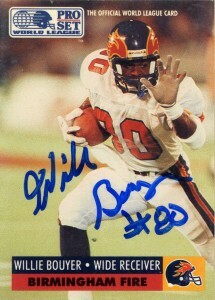 Willie continued to play for the WLAF in 1992. He’d have an impressive sophomore campaign making 57 receptions for 706 yards, leading the team once again in receptions and yards but would go without a touchdown. Willie made some spectacular plays over the 2 seasons with the Fire and was an important target for quarterbacks Mike Norseth, Brent Pease, and Eric Jones. Bouyer signed with the Eagles in 1992 after the dismantling of the WLAF, but did not make the team. Later Willie re-emerged with the Sacramento Gold Miners of the CFL USA in 1993 and 1994. He’d make 15 receptions for 175 yards and 2 touchdowns in 1994 and retired from professional football after the season. I’ve attempted on an occasion or two to get Bouyer’s autograph on his remaining cards, but the mercurial receiver has yet to respond.